BUFFALO, N.Y. -- Drama unfolded at Coca-Cola Field on Saturday night as the Bisons scored a 4-2 victory against the Chiefs. In a tie ballgame in the eighth, the Bisons used a rally to take the lead and the Herd eventually emerged victorious. Jason Leblebijian, a 2018 All-Star, came through in the clutch in the game-deciding inning. After Anthony Alford blooped a single into shallow right field, Leblebijian broke the deadlock after he hit an RBI-double on the ground just inside the third base line. Darnell Sweeney helped pad the lead to two runs when he roped a single up the middle to score Leblebijian. Earlier in the game, Alford played a key role in tying the game at two runs apiece when he led off the fourth inning with a solo shot over the left field fence--his fourth of the year. 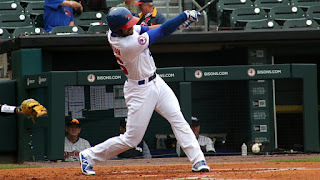 The Bisons got the leadoff man on base five times in the game and tallied a total of 11 hits. With the win Saturday night, the Bisons are now 30-14 when the team has hit a home run. Roemon Fields had been productive batting .287 out of the leadoff spot entering the game and he did much of the same in the win. He collected two hits--an infield single in the seventh and a double in the eighth. Prior to his successful at-bats, Fields was hitless in the game. "For me the key is, I always call it 'The Redeemer,' manager Bobby Meacham said about Fields' at-bats Saturday night. "At the end there when he had a chance to come back up there and swing against a left-handed pitcher and [hit a] line drive double to left field--it shows you some things are starting to pay off for the work they [the players] are doing." Tom Pannone made his Triple-A debut and with the appearance, he became the 12th pitcher to make their debut with the Bisons' this season. Pannone, pitching against the Chiefs (the affiliate of the Washington Nationals), attended the College of Southern Nevada--the same school as current Nationals' outfielder Bryce Harper. He tossed six innings without ceding a walk and kept the Bisons in the game by allowing two runs while striking out six batters. The only smudge on his final line was the two-run home run he gave up to Adrian Sanchez in the third. "I didn't want to do too much," the southpaw said after the game. "[I] just wanted to stay composed and in the moment." During the fifth in a tie game, Pannone put two runners aboard with one out before pitching out of the threat by getting the last two outs of the inning. "I kind of got into my groove a little bit in the second and in the third, I started to feel more comfortable just locating my fastball and got a better feel for the changeup and curveball as the game went on," he said. "I saw him in Spring Training and I was excited to see him pitch here," Meacham said. "He [Pannone] used his fastball really well… fastballs in and out, both sides of the plate. That's the key for him." Buffalo came at the Chiefs with another lefty out of the bullpen with Jose Fernandez. He did a fine job backing up Pannone as he threw two innings and held Syracuse off the scoreboard. In the eighth, the Chiefs got what would have been the go-ahead run at third base, but Fernandez struck out Raudy Read and induced a groundout from Yadiel Hernandez to escape the frame. "I've seen a lot of good things," Meacham said about the lefty reliever. "He throws extremely hard. I think he's not afraid to throw the ball over the plate and challenge hitters. He also used a good slider today… I'm glad it worked out for him today performance wise because he just goes right after the hitters and we got good results out of him today." 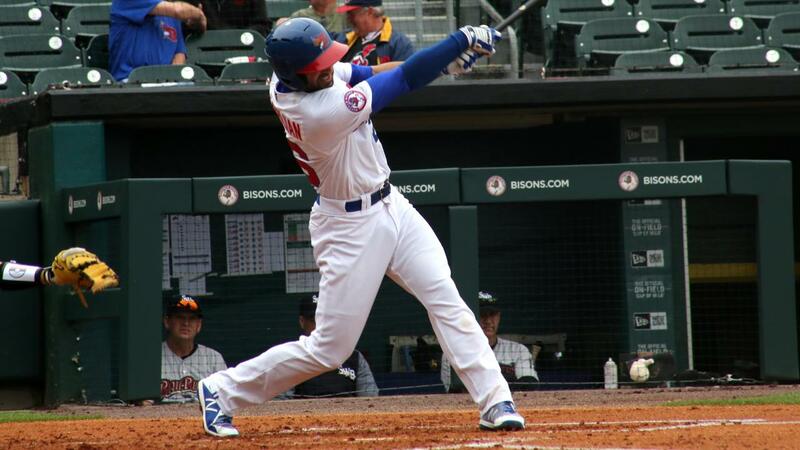 After a solid outing in his Bisons' debut last week, Brandon Cumpton secured the win. In the ninth, he forced two outs to end the game after Syracuse moved the tying run into scoring position. The Herd goes for the series sweep on Sunday in the series finale against the Chiefs with the first pitch slated for 1:05 p.m.